So if we just add primes together, we get multiples of three fully half the time, and the remaining half of the results are evenly split between integers of forms 3n+2 and 3n+1. Naturally we look to the next prime, 5. A given prime is equally likely to be of the form 5n+1, 5n+2, 5n+3, or 5n+4; if we work through the combinations we can see that there are 4 ways to pair these up to get a multiple of 5, and 3 ways to get each of the forms 5n+1, 5n+2, 5n+3, 5n+4. So it seems natural to penalize multiples of 5 by multiplying their $f(n)$ by 3/4; the banding then is even less strong, as you can see below. 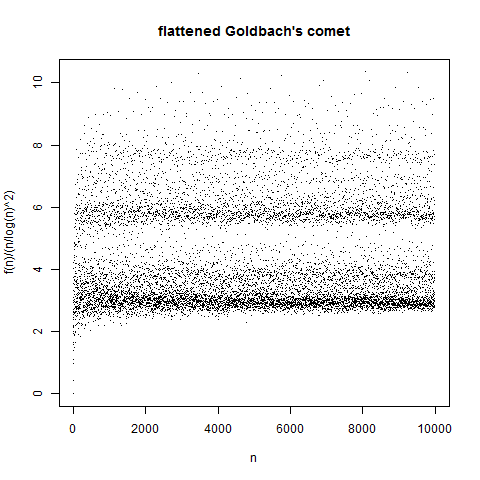 in this case you get the plot below. 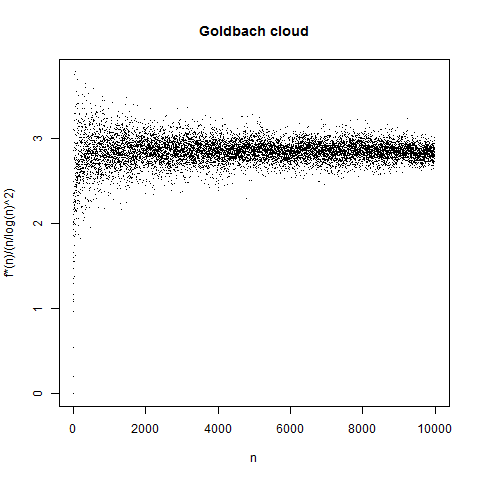 The lack of banding in this plot is basically the extended Goldbach conjecture. 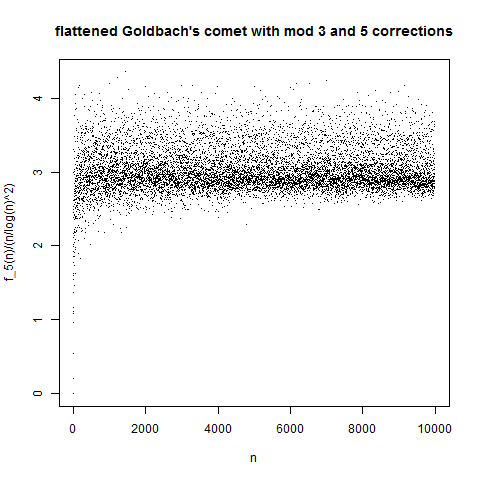 Although I didn’t know this when I started writing, apparently this is known as Goldbach’s comet: see e. g. Richard Tobin or Ben Vitale or this MathOverflow post. 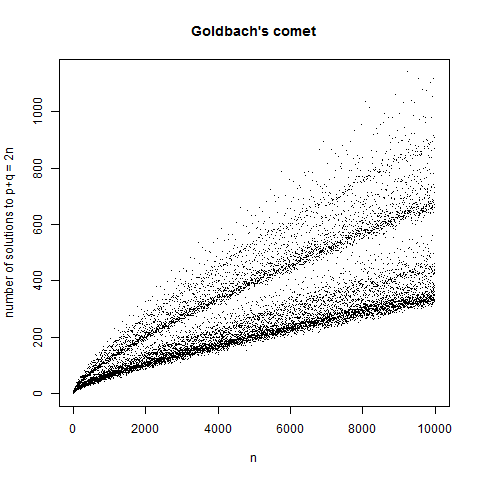 And although this is a number-theoretic problem, much of this is an exercise in statistical model fitting; I proceeded by making a plot, checking out the residuals compared to some model to see if there was a pattern, and fitting a new model which accounted for those residuals. 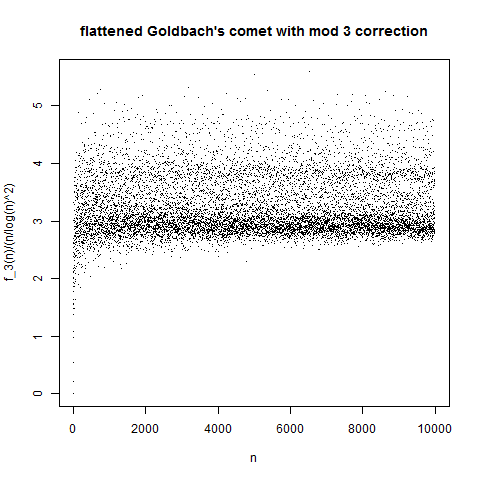 However, in this case there was a strong theory backing me up, so this is, thankfully, not a pure data mining exercise. Previous Post When does fall really start?